Huge coupon savings for laundry must-have! You are here: Home / SoCal City Kids News / Announcements / Huge coupon savings for laundry must-have! School is getting out for the summer which means parents will have even less time for the stacks of laundry that pile up around the house. While ironing is not something most people do on a daily basis, unless work clothes need to be pressed, there are often items around the house and articles of clothing that it would be nice to have less wrinkly if ironing just didn’t take so much time. Downy Wrinkle Releaser Plus is the new iron. Just spray it on clothes, bed sheets, curtains, whatever is creased, tug the fabric to jumpstart wrinkle removal, smooth it and let it dry. Now until June 13th, Downy Wrinkle Releaser Plus can be purchased at Target for up to 40% off. 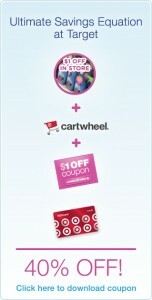 The 1000ml bottle of Downy Wrinkle Releaser Plus is $1.00 off in-stores and is also 10% off on cartwheel. You can stack both of those deals with the $1.00 off coupon on the Downy Wrinkle Releaser Plus website and the additional 5% off if you have a Red Card for a total of 40% off.